Dachshund Gifts for Dog Lovers! It’s heart breaking to see stray dogs. Dogs are meant to be cared for by humans, not left alone to live on their own. Last summer (2013), I started seeing two stray dogs roaming around inside of my gated condo community. They stayed and I saw them constantly. I started leaving food and water out at all times. They would come out of hiding from the green belt and follow me when I walked my dogs. They followed me enough to know where I lived but they would never get close enough for me to touch. I started giving them chicken jerky and the brown dog would come take it from my hand. After a lot of chicken jerky, I had to up my game to get both dogs to come closer and come into my backyard. I started cooking them real chicken and that got the white dog to like me a lot more enough for him to come hang out closer to me. So the plan was to get the dogs to trust that the backyard is a safe place. I couldn’t just trap them there because my fence is short and white dog could easily jump out of it. I wanted to take both of them together. I waited until the day I could get them in the backyard on a business day so that animal control could take them. I still couldn’t touch them, let alone leash them and get them in my car. About 1.5 months later the day finally came when I got the dogs follow me to the backyard during a business day. I got a collar on the white dog and leashed him. I leashed the brown dog too. I tried to lead the white dog and the collar came off. When I tried to go for it again with the collar he barked at me in warning and gurred. Animal Control was called. Called again. And called again. We were told by 5pm… then we were told there’s 2 day waiting period. I can’t hold them for 2 days. I had to stay in the backyard with them all day to make sure they didn’t escape. It was too hot for the dogs to remain outside and they had been on their own too long. As last resort, with encouragement, I just went for it again with a loop I made out of a stronger leash I had and it worked! Leading the dogs to the car was a huge struggle. 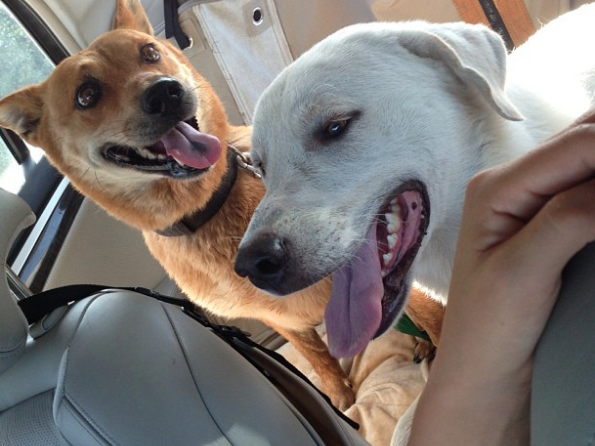 Driving to Austin Animal Center was scary because I didn’t know how they were going to react. We needed help getting the white dog inside the shelter. He got carried in by staff member at Austin Animal Center. 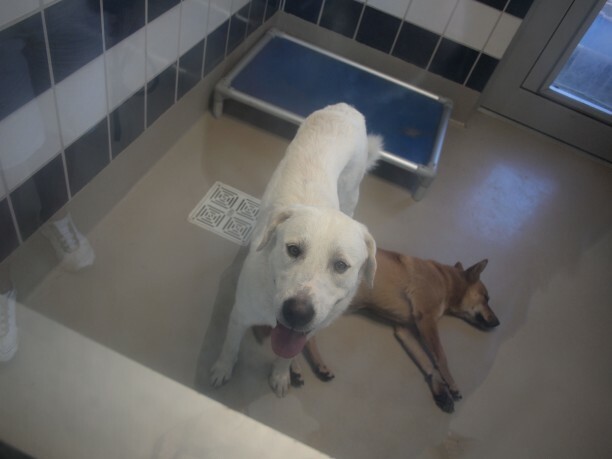 Shelter said the white dog was a Pyrenees mix and most likely feral. Brown dog way chipped. They got placed in the same kennel together in the stray holding area. I think they were happy to be in AC away from the hot Texas summer heat. This all took place on a Tuesday. I went to go visit them on Sunday and couldn’t believe how much they have improved! They greeted me. Let me pet them. Let me walk them. Shelter volunteer said she sees many strays improving like these dogs. 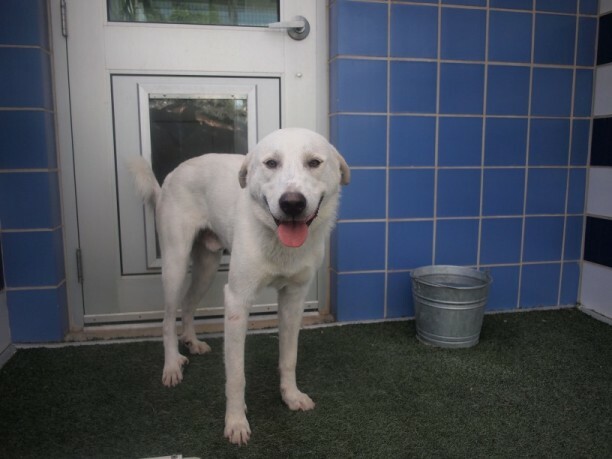 The dogs who get brought into Austin Animal Center are on stray hold for five days. If they pass (no major behavior or medical issues), they are placed in the adoption program. This means they are safe. AAC said their euthanasia rates are really low now. Austin is no kill 90% or more. They were really helpful with sharing information about the dogs and said we could call and email to check on them. The dogs were eventually adopted. Yay! 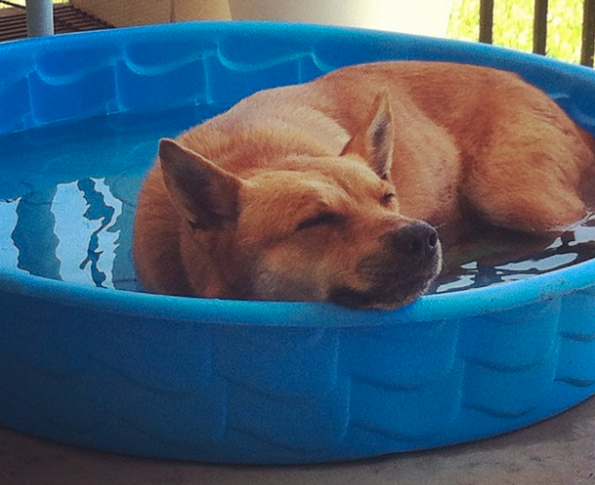 Here are some tips on getting stray dogs to safety. Call out for the dog to come to you. If the dog is an escaped pet, it’s likely that the dog will be friendly and come to you. Check for a dog tag and call the human. If the dog doesn’t have a tag, try knocking on the houses near by. Sometimes you’ll see the dog run right back into their yard and come back out again. The dog will probably stay in that area and is used to going in and out of the gate. Leave the human a note describing how you saw the dog on the road. They probably have an idea of the dog’s activity but hearing from another person will make the danger more real to them. Do not approach if the dog seems scared of you and gives you warning signs to back off. Instead try to herd the dog away from the road to a safe area. If you can’t bring the dog to a shelter, it’s important to stay with the dog until Animal Services show up. Be very detailed with them and let them know the situation. If you have to stop your car to avoid a stray, try not to break suddenly but rather come to a slow stop if you can. Make sure to check for cars behind you and turn on your emergency signal. When this happens, I try to block the traffic behind me and try to slow the cars coming from the other direction. More tips from The Human Society, WikiHow, and Missing Pet Partnership.